This page created on 5th September 1998, updated 18th December 2017. These histories are far from complete. They will grow as I obtain more data. They probably contain mistakes. If you have more data, or corrections, please let me know. 1/58 RG driver/technician training at Reigate, then service on 711. 5/58    Chiswick for suspension modifications. WR driver/technician training at Windsor, then service on 704. 1/59 HG driver/technician training at Hertford, then service on 715. 8/60 SV driver/technician training at Stevenage, then service on 716. 11/60    Chiswick for rear sub-frame strengthening. 12/60 SV service on 716. 4/62 SV bucket seats replaced by bench seats, seating now 57. 11/62    restoration of Lincoln green. 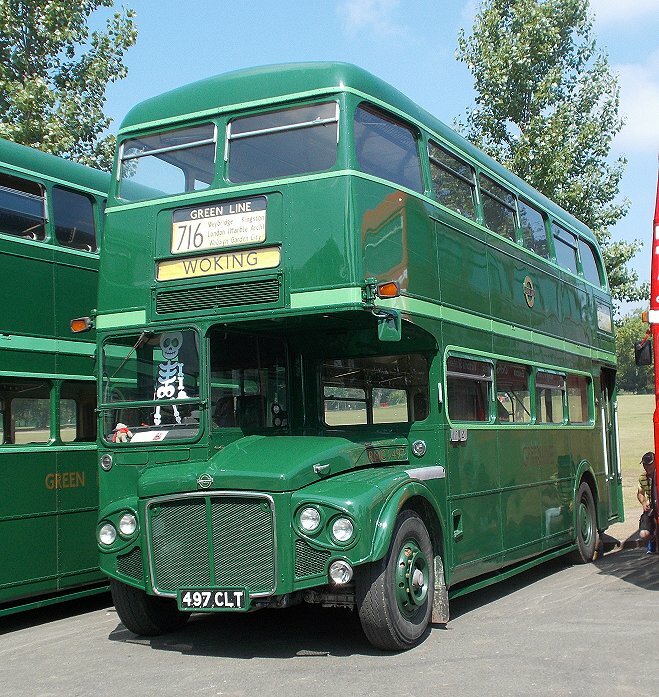 4/64    withdrawn for overhaul: standard RMC front wings and radiator fitted. 1/70 HF conveyed to London Country. repaint into NBC green with white symbols. 5/75 HF to Aldenham for overhaul. 6/76    to Chiswick experimental shop, opening front windows. 4/77 HH loan (Hemel Hempstead)..
HG repaint, retained for display and relief duties. 4/80 HG special duties: Cobham Open Day. 9/86 DS transferred to London Country (South West) Ltd.
2/88 DS privatised to London & Country. 10/89 CY transfer, still for display or occasional service use. 8/62 HF change store (Hatfield)..
3/03 EC to France and back for unveiling of new "Queen Mary"
10/09 EC on display at Stoke d'abernon station for 'London on the  Fringe' event. 11/77 RE transfer into store (Romford)..
repainted in red with gold lining. 1/70 GY conveyed to London Country..
1/72 SA loan, trainer (St.Albans)..
1998    Nostalgiabus, hire PSV, GreenLine livery. 9/98    Nostalgiabus: at Showbus in red/cream. 1/72 DT loan, trainer (Dartford)..
heater grilles, fleet logos, fleetname. 9/75 GR change store (Garston)..
3/88 FW repainted to standard livery! 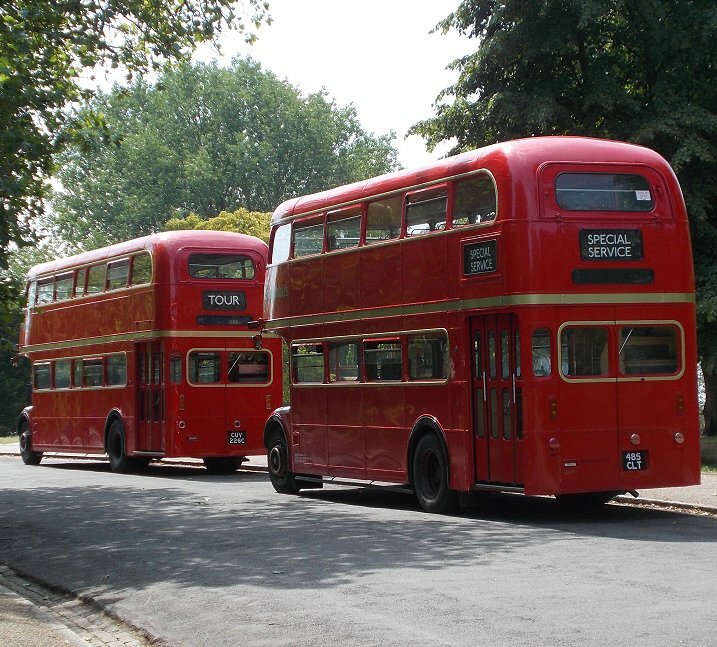 10/62 HG into service, Greenline livery, 715/A..
10/62 HG into service (Hertford), Greenline livery, 715/A..
10/62 GF into service (Guildford), Greenline livery, 715/A..
11/68 RE short loan, 721/2 cover (Romford)..
10/80 A  trainer, repainted in NBC green with bullseye! 3/87    collided with low bridge! 1996    open-top, in Bremerhaven, Germany. 2/80 SJ withdrawn, then trainer..
2/94 U  repainted to red with cream lining. 10/62 ST change store (Staines)..
10/62 SV change store (Stevenage)..
10/71 DG transfer: RCL overhaul cover (Dunton Green)..
12/67 R  transfer: London spare (Riverside)..
red mudguards and lifeguards, gold bullseyes. 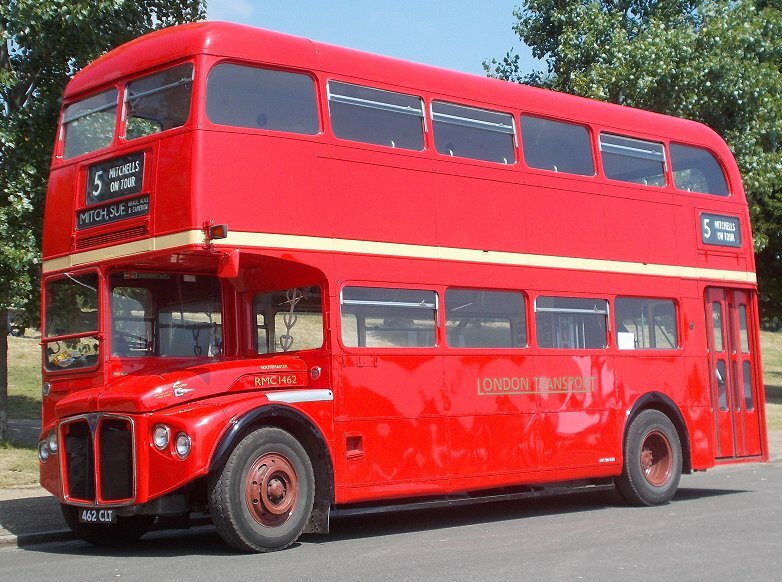 1/72 SA transfer, trainer (St.Albans)..
1/72 HG ..transfer into store (Hertford)..
1/79    bought by London Transport..
8/10    purple, advertising "The Love Bus"
by 7/12    bought by the London Bus Company, Northfleet as "Silver Limo Lounge"
11/62 GR ..transfer, trainer (Garston)..
9/75 GR change store: recertificated..
1996    promo vehicle, Perpignan, France. 9/92    PSV with North Mymms. 1/75 GR from repaint, unlicensed..
10/70 WY from repaint (Addlestone)..
12/76 GY transfer into store (Grays)..
11/76 NF transfer into store..
4/77 HH transfer (Hemel Hempstead)..
1/63 WY into service, Greenline livery, 716/A..
1/75 GR transfer into store..
1983 V  Chiswick skid bus, red, "London Transport"